Words don’t appear out of thin air. They are borne of ideas and values, and painstakingly combined, chosen, then refined. Over, and over, and over again. V2 of their website doesn’t have as many words, but the main story in the explainer video is how communications limits growth (“I told him my company runs entirely on email and Dropbox, and we were doing just fine… This wasn’t sustainable as I wanted my company to grow. Something had to change”). The question the website tackled was, “Does Slack really work?” The website would serve the answer, also ideally compelling readers to take action. I don’t believe this is a step backwards or an oversight. In V1, Slack started off with a benefit (“Be less busy”). In V3, Slack wanted to take greater control of how people described them. For example, Slack took care to frame itself as “a messaging app,” instead of a “chat app” like The Verge and Time’s descriptions of Slack. The connotation of “messaging” sounds more professional and modern than “chat” (AIM, ICQ, etc). Both these sentences are deliberately put there for people to easily remember and share through word of mouth. In that situation, the conversation might’ve ended with, “Oh, we’ve already tried that.” Slack would be better served having as many people as possible share an easy-to-remember message. In V3, Slack sells a product and lead feature because it’s easier for customers to understand, remember, and share through word of mouth. They’ve established the results they can generate, the messaging that resonated, and they want to pour fuel on the fire with word of mouth growth. Naturally, chances are Slack might’ve had a hand in crafting these testimonials as well — similar to how authors get busy people to write book blurbs. As people build familiarity and trust with the brand, they are no longer interested in the solution’s credibility. The higher priority in the product capabilities. Slack eventually moves these testimonials deeper into their website. I’ve noticed that Slack follows the Rule of Three very closely (“omne trium perfectum”). If you look above at the testimonial screenshot, they’ve spread out three descriptions amongst the testimonials (“It’s like an infinite brain for your whole team,” “Make better decisions, faster,” and “One search box for everything”). Fast, flexible messaging for Mac, PC, iPhone, iPad & Android. Archived and organized as you go, with configurable alerts, notifications and sync so you never miss a beat. Share, serve, star & comment on files. Images, PDFs, text snippets, zips — even files you store elsewhere, like Google Docs — are all indexed & accessible wherever you go. Slack is built around search from the ground up. It captures everything you put in. Slice, dice, filter, sort and winnow: you’ll find what you need faster. V3 — This is a rotating header GIF. Plug the tools you already use into Slack and get all your notifications in one place. Focus your search to find messages or files from a specific person or time. Although it’s nice that search was built from the ground up, as described in V1, by V3 Slack figured out that most people want two things — to find something from a specific person or time. Which means, by default, V1’s “Modern Messaging” became V2’s “available wherever you go” became V3’s “Channels.” V3 took a completely different turn here. “Modern messaging” and “available wherever you go” were basically about Slack’s mobile capabilities. But, Slack decided that Channels were more important by V3. I suspect this decision was actually made last minute (considering the copy is missing a full stop). Mobile was already table stakes for software far before this point, so it was safe for a reader to assume that Slack had mobile. More importantly, this point cements the idea of “organization.” Rather than being restricted to “chat rooms” (vernacular which Hipchat — later Stride — used until the bitter end), teams could organize conversations through teams, projects, and topics. Slack’s original “land and expand” business strategy was one applied by VMware, Twilio, and Salesforce. Sell software with a pricing model cheap enough for people to buy right away, without permission from legal or accounting. The software will then spread through the organization, growing through word-of-mouth, and pricing will increase accordingly (e.g., Slack charges per user, Twilio charges per message, VMware charges per instance, etc.). Up till this point, I’ve only looked at Slack’s V1, V2, and V3 because they each attempted a variation of this same strategy — solving communications problems for modern teams, typically in large technology organizations or smaller startups. V3 already starts to make this change, starring NASA in V3.5. But in V4 of their website, Slack shifts to a new audience. It addresses a different problem, speaking more directly to the business managers at large enterprises, and no longer the people working for them. 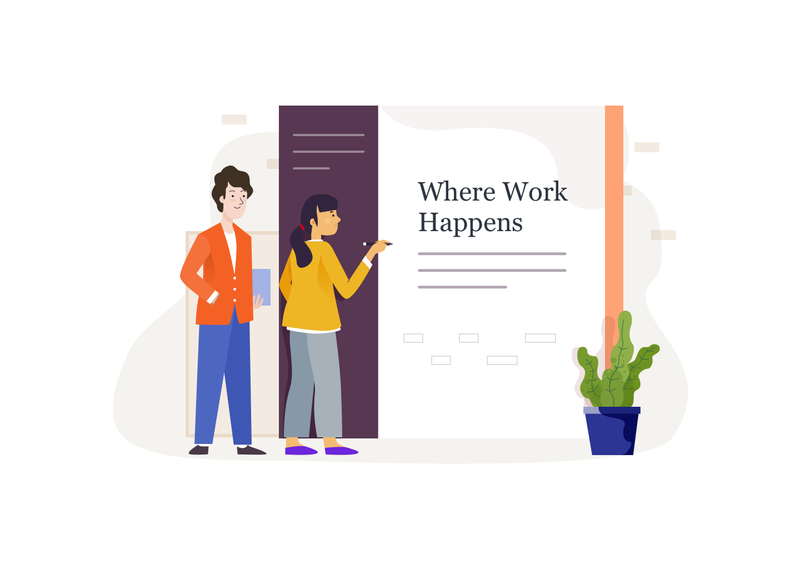 *Whatever work means for you, Slack brings all the pieces and people you need together so you can actually get things done. In contrast to Slack’s original promise that users would “Be less busy,” or that it was “a messaging app for teams,” “Where work* happens,” is the promise that Slack is the place where work happens. It’s a different promise to many more people than its original one. And it doesn’t even mention a word about messaging or communications. Slack’s business strategy was to solve communications problems as a trojan horse into organizations. They reveal a larger ambition here, to become a productivity suite. They no longer focus on just the “communications” portion of “work,” which shows future features/products will target other productivity challenges. If we were to extrapolate from V3, it could be trying to put “All your work in one place.” This message change coincides with the first year anniversary of Slack’s VC fund announcement. The fund encourages third party integrations and expands Slack’s capabilities. The asterisk syntax is likely remixed from Nike’s mission, “To bring inspiration and innovation to every athlete* in the world.” which co-founder Bill Bowerman clarifies, “If you have a body, you are an athlete.” Much like how honors athletes, and then expands the definition to everyone, this is Slack’s attempt to expand their app beyond a single limited audience. It’s not the first time Slack would remix one of their aspirational brands’ tactics. The product-centric content from V3’s homepage didn’t disappear into thin air. Instead, they move it to the product page (/is), with slightly refined copy, and a new product highlight. More of this in the follow-up article, which will cover Slack’s content strategy. Gartner might call Slack a “workstream collaboration (WSC) solution,” but Slack’s writing appeals to people unfamiliar with those words. Instead, Slack is positioning itself to usher in an entirely new, amorphous, category. Slack’s description remains concrete, without mentioning buzzwords like “teams,” “collaboration,” or “productivity.” Similar to their manifestation as a messaging app, the WSC solution label is just a temporary phase for them. Ushering in a new category is no easy feat, especially one where an antiquated technology like email has reigned supreme for decades. There’s a reason for the inertia. And yet, Slack pushes forward, betting that their product and clear communication will enable people to see Slack’s value. I remember going through a client pitching exercise with one of their advisors. After all our pitches, the advisor said, “The pitches were good, but you need to excite and inspire me.” I believe most salespeople get taught this lesson in some way or another. Unfortunately, this often manifests itself as some version of, “I’m excited to tell you that an opportunity has arisen…” and a reader that’s about to close the tab. Even though organizational transformation is what Slack sells (as described by Butterfield), they never blatantly mention it. For starters, “organizational transformation” would be far too jargon-y for their voice. Instead, Slack infuses their website with examples. Some more obvious ones — V2 shows viewers how Sandwich Video changed after implementing Slack. In V3.5, Slack gives people a taste of how their messaging app transformed NASA. Many technology companies are caged into an earnest approach that doesn’t do their product justice. They embrace a boisterous version of Slack’s V2 (“A platform for team communication”), when they’d be better served describing a result (V1’s “Be less busy.”), or a larger vision for the future (V5’s “Where work happens”), and showing examples of what they’re really selling. Slack started with a very simple user-centric value proposition (“Be less busy”). This phrase and the subheading create a strong visualization, a pattern that lasts every iteration of their website. As you revise and upgrade your website, build it to pace with where your product is, and what your most important readers’ pains and desires are at the time. People — “readers,” “customers,” “the market,” “users” — change constantly, and so do their thoughts. Special thanks to Joey Loi and Vijay Jeyapalan for their thoughts on early versions of this. Thanks for reading! I’m Herbert, the creative director at Wonder Shuttle. We’re a marketing studio that works with clients such as Shopify, Wattpad, and Twilio on websites and content. Our content canvas is a framework that marketers and strategists use to create useful, contagious content. As of July 2018, SimilarWeb estimates Slack’s homepage is visited by 7.5% of 128m pageviews. This story is published in The Startup, Medium’s largest entrepreneurship publication followed by 355,974+ people.